I recently read a somewhat old post about world building from the Tales of the Grotesque and Dungeonesque blog. I've talked in the past about simplifying world presentation, and the post really resonated with me. Years ago, I definitely was the type of DM who wanted to detail his world to the nth degree (though generally after I over-detailed something I would get tired of it and move on to something new - tells you something about doing that which I didn't catch onto for too long...). But I've seen that, in general, your players really don't care about that sort of thing. Heck, when I'm a player I rarely care about that much detail. Which is the point that the post above makes, among other things. World-building is a fun activity, and if you want to go into hyper-detail mode, go nuts. But don't think you're doing it for anyone other than yourself. 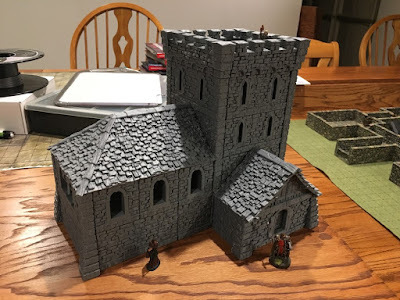 A couple months ago I backed Printable Scenery's "Time Warp" Kickstarter, specifically the "Rampage Castle" (the Western buildings were cool but I didn't need them, and the Europe line, also cool, wasn't something I was that interested in). The first thing I built with the castle sets was a basic tower; I'm not going to go into that here since detailed instructions on available on the PS site and in their YouTube channel. I recently (well, about 7 months ago) got into 3D printing, initially spurred on by Fat Dragon Games' second Kickstarter for their Dragonlock line. Since then I've also been printing objects from Printable Scenery, free objects from Thingiverse, and other places. As I've been a little light on blogging here, I figured I'd start adding discussion about this new facet of the hobby. It's very cool, more affordable than ever, and the potential is pretty amazing. While cleaning up some old bookmarks, I found this blog post from almost 10 years ago: Guiding player movement. It's interesting since what Shamus describes is something that I've started doing recently (with a fair amount of success), though I originally got the idea from the excellent Hill Cantons blog. Specifically, his first post on "point crawling" (and one of the commenters references the other article). The Campaign Guide and House Rules page has been updated to reflect allowed material from Princes of the Apocalypse and the Sword Coast Adventurer's Guide, as well as clarification regarding material from Unearthed Arcana.